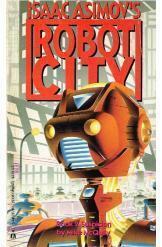 Isaac Asimov's Robot City: Suspicion, Mike McQuay, 177pgs. Derec, still with no memory, stranded in a city of robots, meets Katherine, a woman who claims she knows who he is but refuses to tell him. The only inhabitants of an entirely robotic planet, are the only two logical suspects of a murder.